World Soccer: When you were growing up in Kitwe, how realistic was it to be a professional footballer? Rainford Kalaba: I was born in Mufulira, 45 Minutes outside of Kitwe. My father watched football all the time on TV and in the stadium. And I was always on his side from when I was seven years old. Then I started to play football in the school and was selected in the Academy at 14 years old and then at 16 by Kitwe’s Africasport. They were an amateur club who lifted from division three to division two in my first season, then from division two to division one in only my second season and in my third season finished as champion. Jacob Mulenga played in the same club. So, to be a professional footballer after a time was my natural way. You were just 19 when you left Africa and went to Nice. You only stayed in France a short time. What happened? Did you have opportunities to stay in Europe after you left Nice in 2006, or was it your choice to go back to Zambia and sign for Zesco United? After two years back in Africa with Zesco, you went back to Europe again and signed for Braga? What made you go return after your earlier experience? Was Portugal any easier for a Zambian player than France had been? RK-With Zesco it was a fantastic adventure with seven trophies among them the best player and the top scorer of the year in 2006. In Braga, it was easier for me than it was in Nice because the football in Portugal is more technical compared with France. And for a player with my pace it’s better too. When you are not physical you have to find another way. I played some games but after two years Braga wanted to send me to Zamalek on loan. Then came TP Mazembe’s offer from the chairman Moise Katumbi who called me. I knew Mazembe because we played in Congo with the Zambian national team and had made our training camp in Lubumbashi. After winning the African Champions League in 2009 and 2010, TP Mazembe appear to be signing the Galaticos of African football. Was this ambition that the club and their chairman Moise Katumbi have the reason that you went to Mazembe? RK-No, not the Galacticos aspect but the ambition of the club yes. 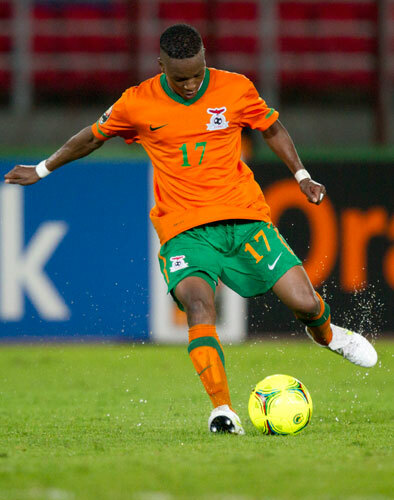 At the end of 2011, Zambia were fortunate to beat the Comoros. Six months later, Zambia became the champions of Africa. What did new manager Herve Renard do to produce that change? After Zambia’s win in the 2012 African Cup of Nations, will this make moving to larger clubs in Europe easier? Would you go back to Europe again? RK-Of course, but before that the Zambian national players are decided that we must extend our reputation with a high achievement in Brazil during the next World Cup in 2014. Then we will have an even stronger reputation with the European clubs. If the opportunities come I will go back to Europe, if I am sure that I can be happy in my football and in my life too. Is there a benefit to players in changing the Cup of Nations so that it is no longer held in the same year as a World Cup or European Championship? Or will this change only benefit those European clubs that don’t want to lose players for up to six weeks during their season? RK-The change will benefit first to the second category of players in future years. But now the European clubs will be more open to sign an African player when they know that the player will be more present. You were injured for the second and final Cup of Nations qualifying game with Uganda. How frustrating was it to watch that game from the sidelines? RK-It was very frustrating and I watched as well TP Mazembe’s African Champions League semi-final against Esperance from the stand in Tunis. It was very frustrating because Zambia has qualified. TP Mazembe is a bigger regret because we are out. And I have the feeling that SUNZU and me we missed the occasion to qualify my club for the final. In the 2012 final, you were the only Zambian to miss a penalty. Would you have volunteered to take a penalty against Uganda in the African Cup of Nations second leg if that tie went to penalties? RK-Yes, no problem; a lot of great players have missed penalties in the past. I am always ready to take a new opportunity. What do Zambia need to do in South African to hold on to their Cup of Nations’ title? RK-The two priorities are to have the same unity in the team and the same spirit like last January in Gabon and Equatorial Guinea. Then we can win again.